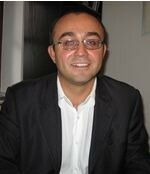 Vladimir Petronijević is Executive Director in Group 484, where he works since 2005. He is responsible for the organisational internal development, fundraising, project management and for external performance. He worked as a Legal Adviser in The Cabinet of the Deputy Prime Minister for EU Integration Bozidar Đelić and was responsible for the legal affairs in the EU integration process focused on visa liberalisation issues (EU visa liberalisation Road Map benchmarks directly or indirectly were focused on refugees and IDPs ). Vladimir Petronijević has graduated at Faculty of Law, University of Belgrade and has Certificate of Bar Exam. He is member of Executive Committee of European Council for Refugees and Exiles (ECRE). In addition, he was the member of UNDP consultant group: Expert for Human Development Report (refugees and IDPs), Consultant on IDPs Employment Issues and Consultant on Diaspora Position in Serbian Legal System. Petronijević is also member of National Council for EU Integration.He conducted several researches and participated in creation of numerous publications on human rights of refugees. Petronijević also gives lectures upon request.